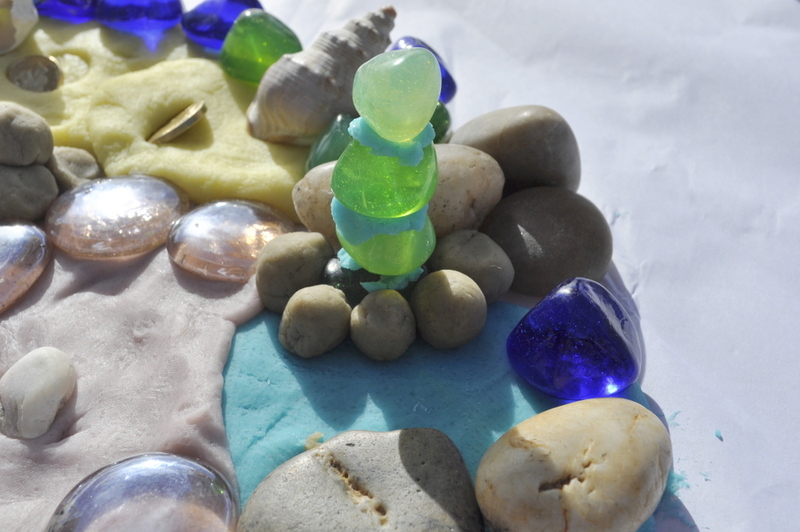 This is a fun way to take play dough play to a new level. 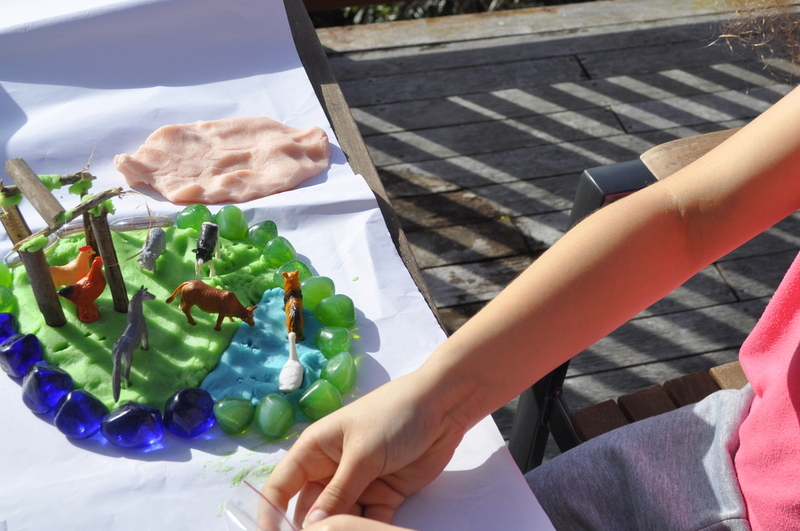 It’s easy to whip up play dough kits, perfect sort of activity for a weekend or the school holidays. 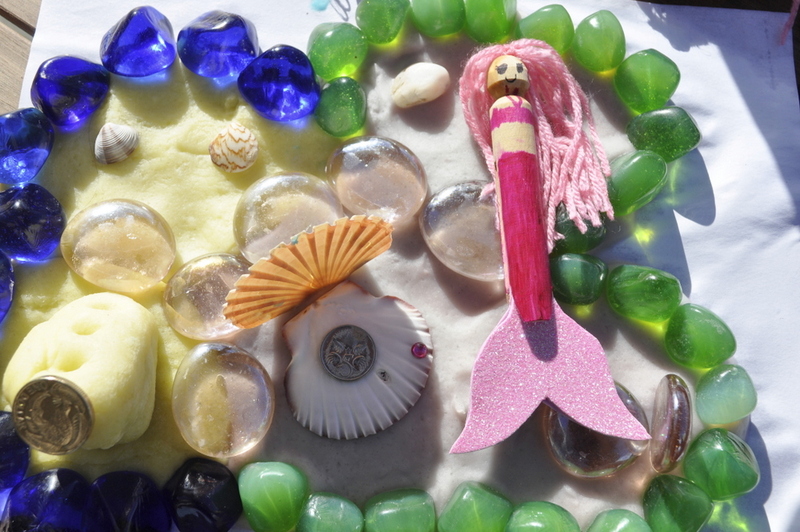 Below are examples of kits I have done before: Farm/Mermaid/Construction. 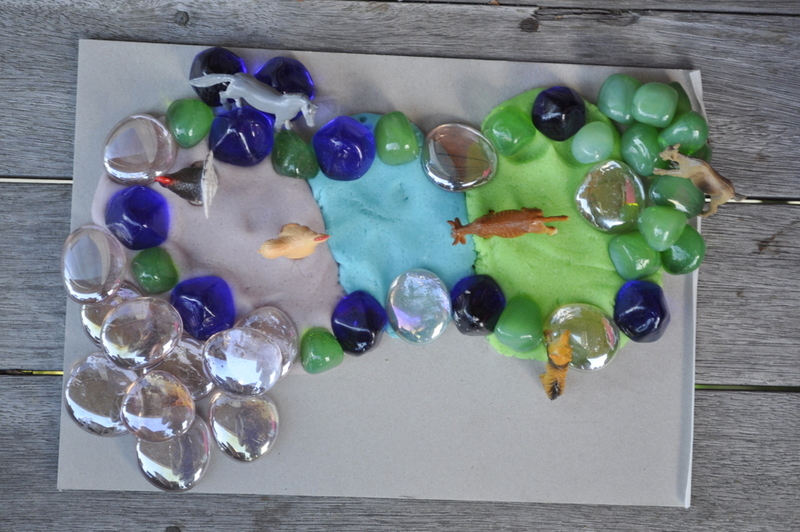 I was surprised how engaged my older kids were with this activity. Even my teen had a great time “designing something for her brother”. Haha. Gift – fab home made gift idea! Like any potential messy activity, there are a few things I do to make this doable for me. 1. 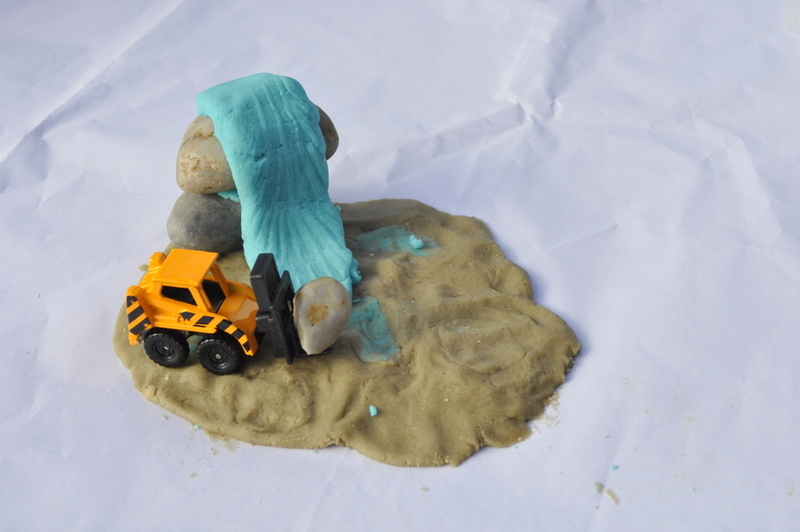 Have play dough already made (or buy some). You can find the recipe I used here, or there are 6 different variations here. I allocated an hour one afternoon to make a big batch of different colours, separated them into portion sizes (per child) into zip lock bags and placed them in the fridge for when I wanted to do this activity with the kids. 2. Pick the right time to do these sorts of activities. It works best if we aren’t rushed. 3. I find it best to place paper mats down for the kids to work on. Or a plastic/paper tablecloth is brilliant for this type of thing. 4. 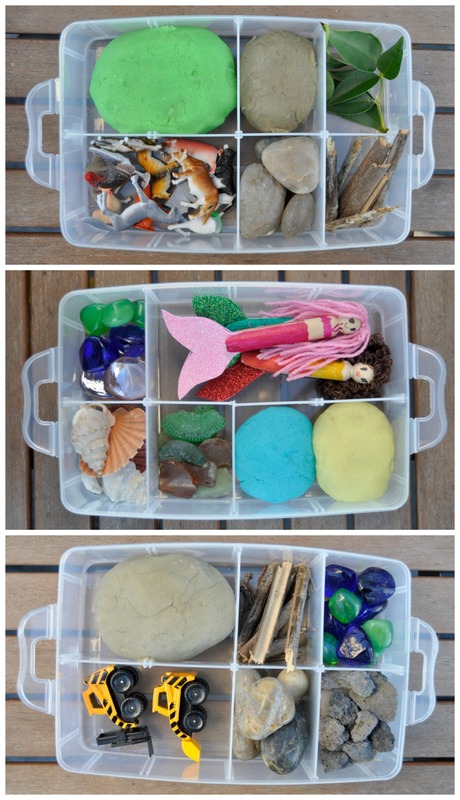 I had craft containers (with separators) to store all the bits in but set up can be as easy as putting out plastic bowls of materials, or even one big container filled with stuff kids can use to create. 5. 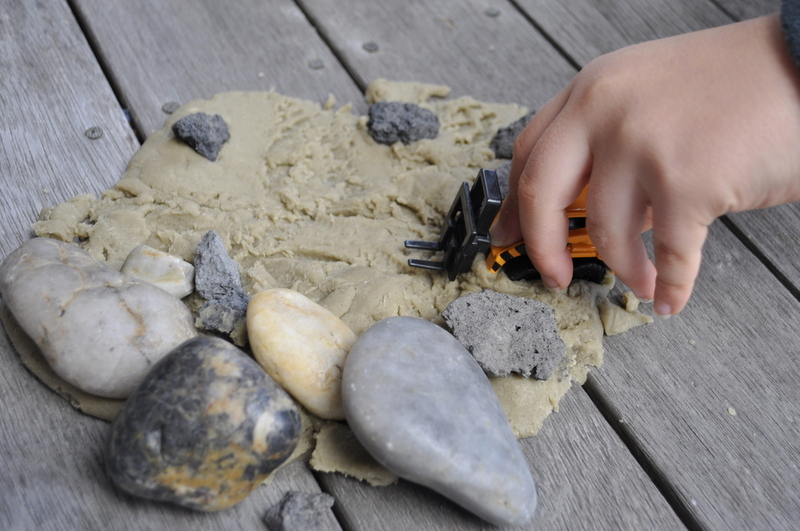 When the kids are done, it’s surprisingly easy to collapse it all back into a kit, as long as the play dough is not sitting for more than half an hour (for home made play dough). 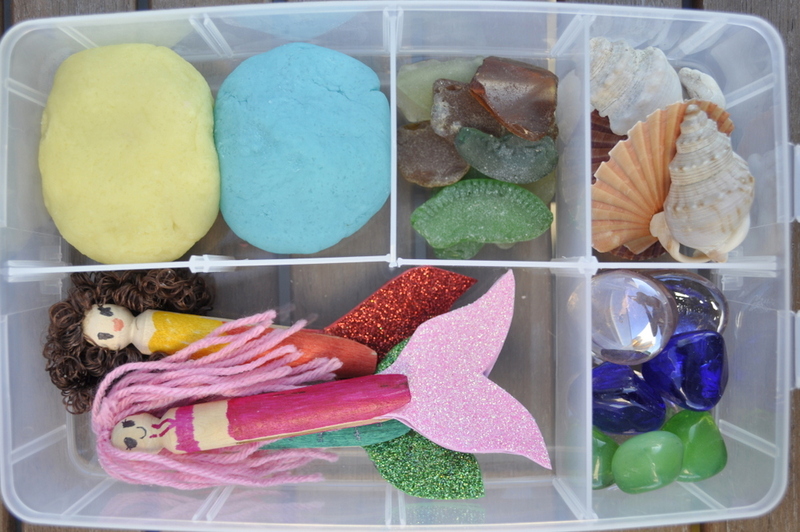 Pick out all materials/toys from play dough and throw into container or a craft kit is fabulous. Then scrap off the colours you can salvage, ball up each colour and put into zip lock bags (what I use) or air tight containers. I keep play dough in the fridge. 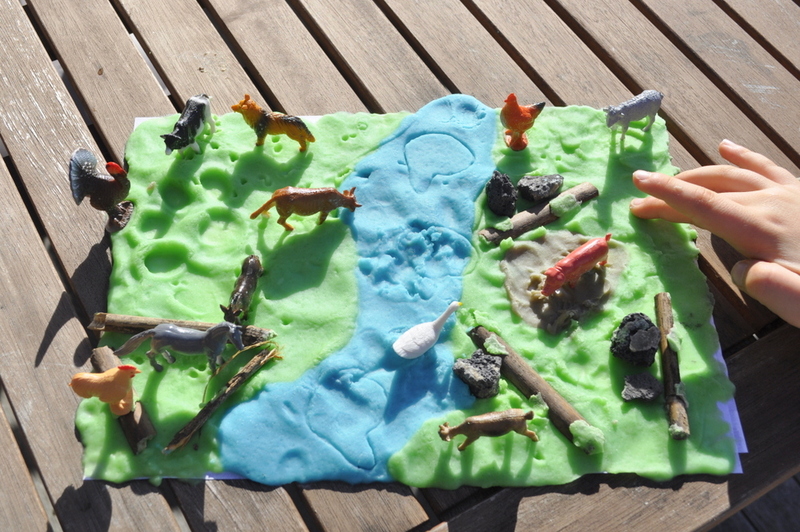 This batch of play dough lasted easily three rounds of this activity. 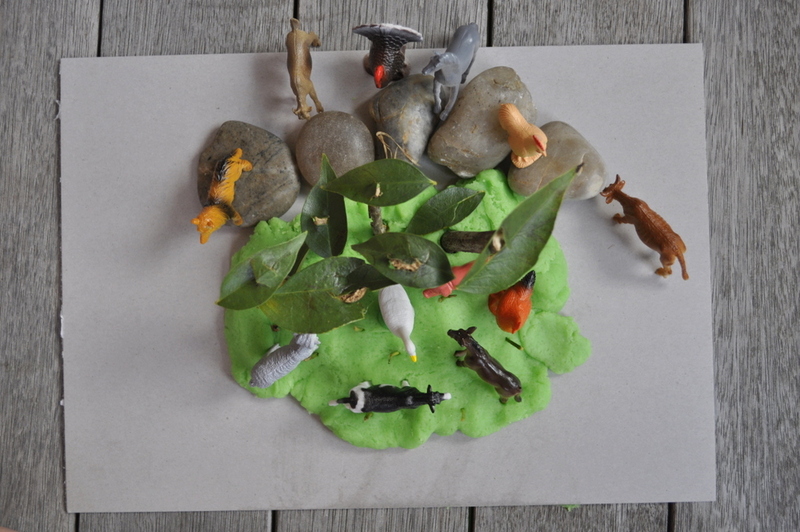 Some of the play dough can get yucky so I just throw that out with the paper. Clean up usually takes less than 5 minutes. 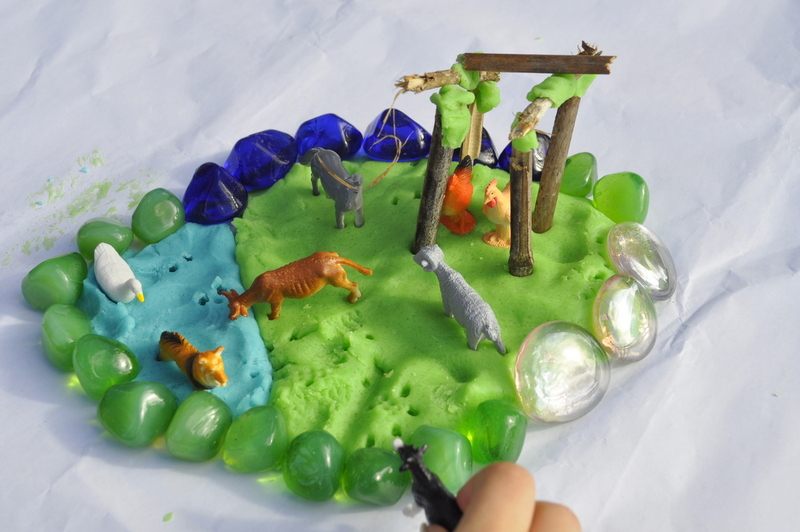 Another option for much loved scenes, it to allow them to dry and display them for a while (but the play dough won’t be able to be used again). 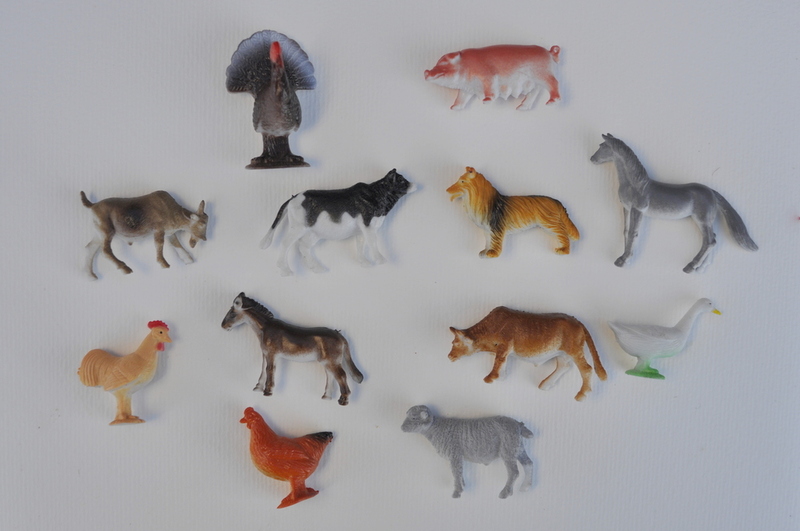 The kids loved the farm animals best, and they are really cheap if you don’t already have a set. Find them at most toy stores, and even in some party stores. 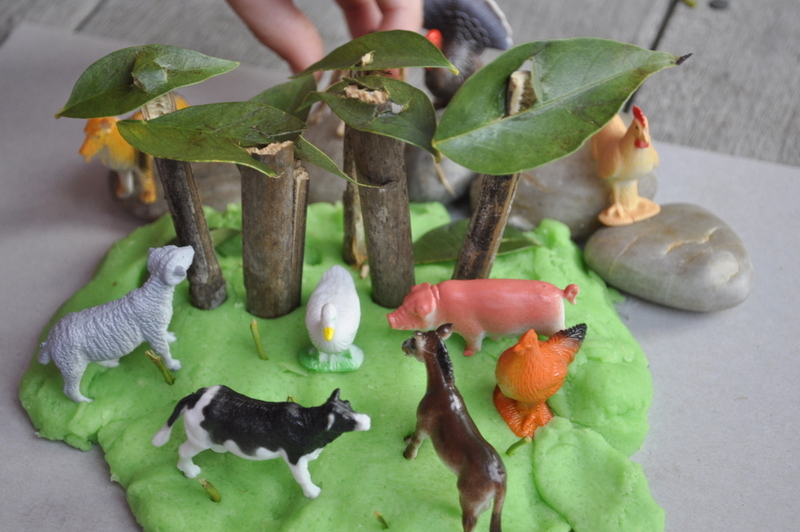 Below are the different things my kids did with them (I didn’t prompt or guide them; they just did their own thing). 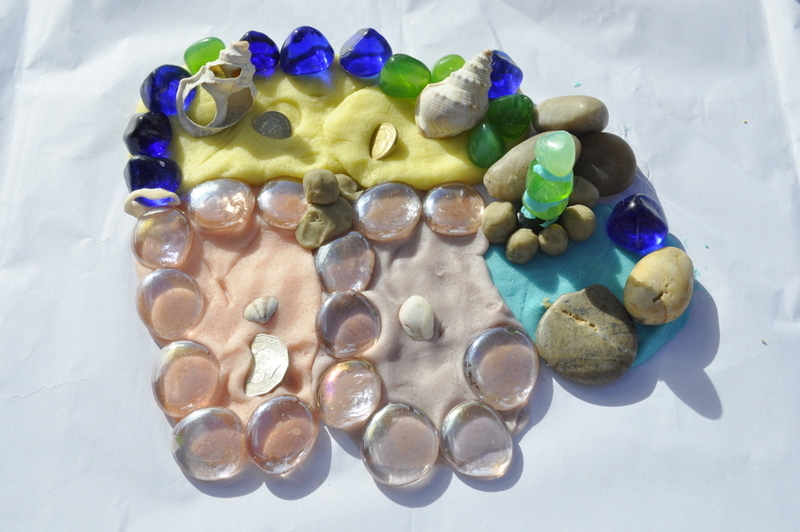 One of the things my kids and I love to do is look for beach treasures so we have quite a collection now which made throwing this together easy. 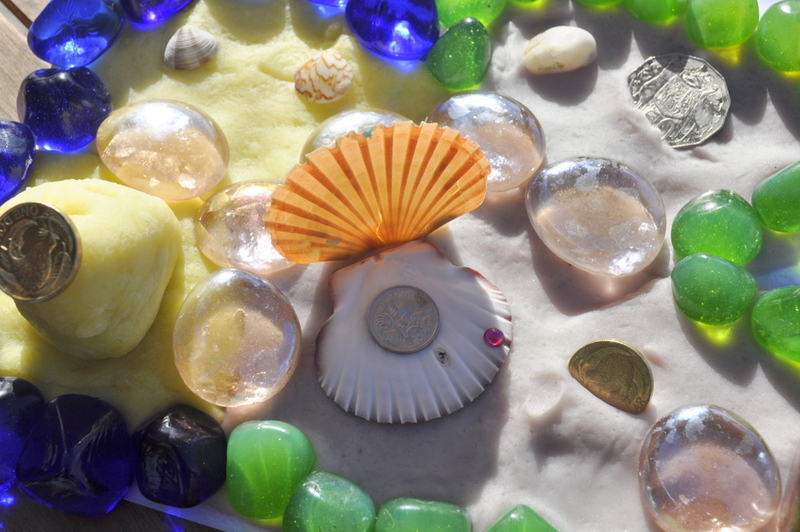 One of the gorgeous things one of the kids made was a opening clam with a coin inside. So clever. An easy one to throw together. 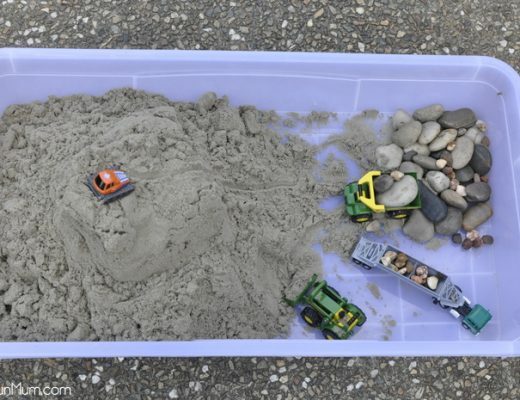 Just look around the backyard for most of the materials. This is really a great idea. I just wonder where I can find affordable containers. 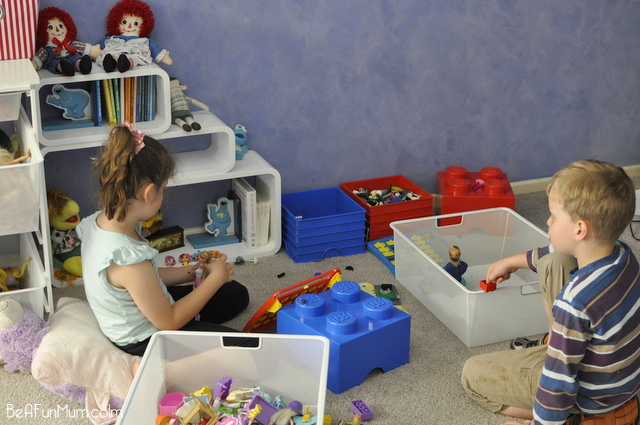 I really like the organization and prompts for the kids. You can find them at discount stores for cheap. They aren’t expensive at Spotlight either. This is great! 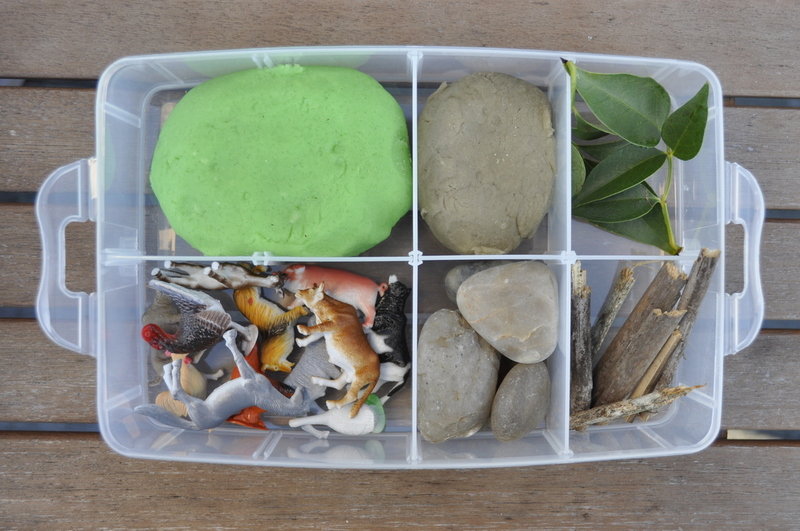 My daughter loves playdough and we have a big tub of things she plays with with it. 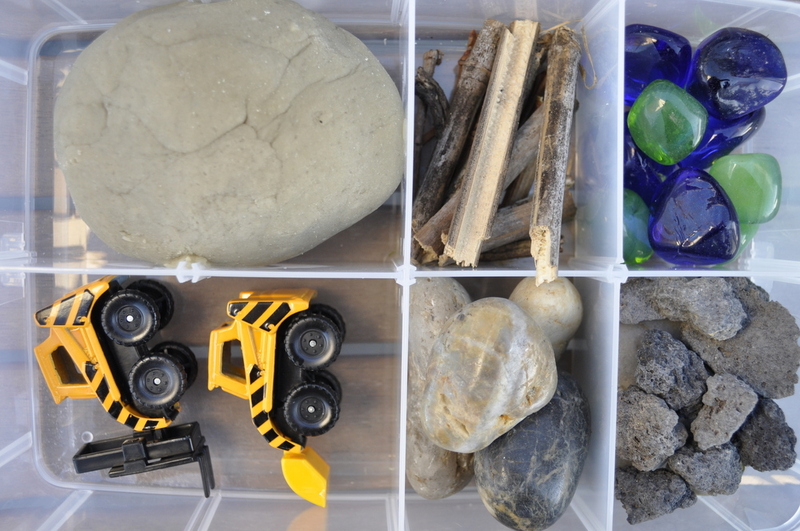 I think tomorrow on daycare day i might make a couple of theamed boxes though and sort out the cutters and things. Thanks for the idea! I think this might be my Christmas present for all my friends kids! What an awesome idea! Thanks!